HAMILTON to anchor 2019-2020 Broadway at the Bass season! BROADWAY AT THE BASS SEASON! 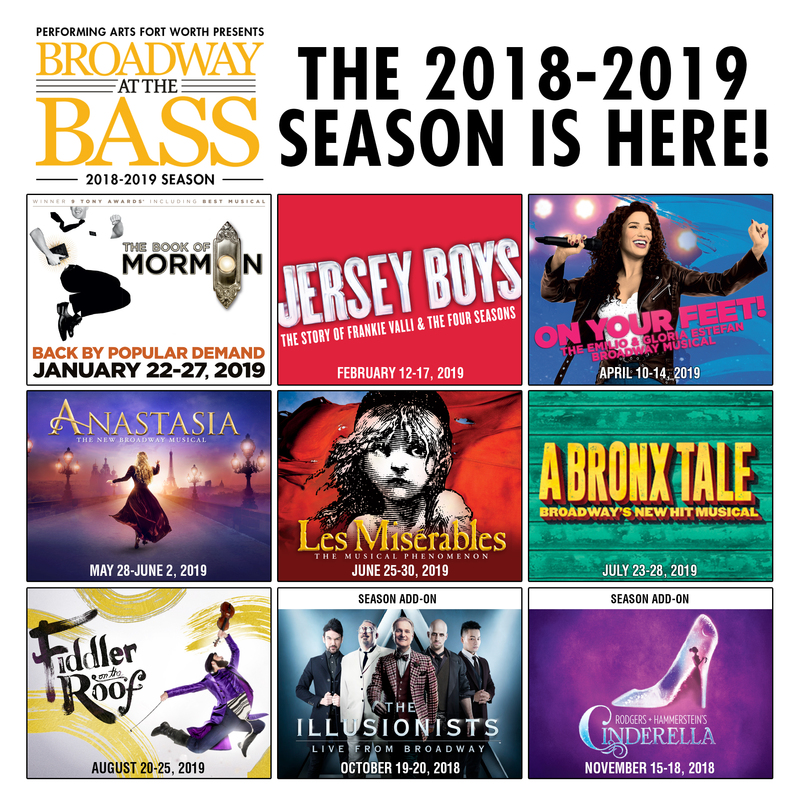 Performing Arts Fort Worth is proud to announce HAMILTON will anchor its blockbuster 2019-2020 Broadway at the Bass Season at Bass Performance Hall! Joining HAMILTON will be the triumphant return of Cameron Mackintosh’s spectacular new production of THE PHANTOM OF THE OPERA; Broadway’s tastiest hit, ROALD DAHL’S CHARLIE AND THE CHOCOLATE FACTORY; the acclaimed new production of the legendary musical MISS SAIGON; Broadway’s most beloved musical HELLO, DOLLY! ; COME FROM AWAY, a breathtaking new musical written by Tony nominees Irene Sankoff and David Hein; the hilarious and heartwarming musical JIMMY BUFFETT’S ESCAPE TO MARGARITAVILLE; and a new production of iconic musical phenomenon JESUS CHRIST SUPERSTAR. In addition, Performing Arts Fort Worth will welcome back a trio of audience favorites as Season Add-Ons: the global smash hit, BLUE MAN GROUP; BEAUTIFUL – THE CAROLE KING MUSICAL, which tells the Tony and Grammy Award-winning inspiring true story of singer Carole King’s remarkable rise to stardom; and THE COLOR PURPLE, the 2016 Tony Award-winner for Best Musical Revival. Performing Arts Fort Worth also announces the long-awaited return of Disney’s THE LION KING. Winner of six Tony Awards, including Best Musical, THE LION KING will return to Bass Hall as part of Performing Arts Fort Worth’s 2020-2021 Broadway at the Bass season. Season ticket holders for the 2019-2020 season will have first access to reserve their seats for THE LION KING when they renew their season tickets for the 2020-2021 season. The dates and performance schedule will be announced at a later date. Broadway at the Bass eight-show season packages start at $343.40. That’s an average of about $43 per show. Season tickets can be renewed or purchased online at BassHall.com; by phone at 817-212-4450; or in person at the Bass Performance Hall box office at 525 Commerce Street. Box office hours are 10:00 a.m.-6:00 p.m. Monday-Friday and 10:00 a.m.-4:00 p.m. Saturday. A four-installment payment plan is available to both renewing and new season ticket holders. In addition, season ticket holders who renew or purchase a new season ticket package will have first access to purchase tickets for the Season Add-Ons BLUE MAN GROUP, THE COLOR PURPLE and BEAUTIFUL – THE CAROLE KING MUSICAL. Perks of being a season ticket holder include the interest-free payment plan, savings over day-of-show single ticket pricing, the exclusive privilege to exchange tickets if they can’t make a performance, and priority access to tickets for the Season Add-Ons before anyone else. Subject to availability. Plus, 2019-2020 season ticket holders will have first access to tickets for Disney’s THE LION KING when they renew their seats for the 2020-2021 season. Tickets to individual shows in the 2019-2020 lineup are not available for purchase at this time. On-sale dates for individual tickets will be announced at a later date. THE PHANTOM OF THE OPERA returns to Bass Hall Sept. 24-Oct. 5. Cameron Mackintosh’s spectacular new production of Andrew Lloyd Webber’s THE PHANTOM OF THE OPERA makes its triumphant return to Fort Worth as part of its North American Tour. Critics are raving that this breathtaking production is “bigger and better than ever before” and features a brilliant new scenic design by Paul Brown, Tony Award®-winning original costume design by Maria Björnson, lighting design by Tony Award®-winner Paule Constable, new choreography by Scott Ambler, and new staging by director Laurence Connor. The production, overseen by Matthew Bourne and Cameron Mackintosh, boasts many exciting special effects including the show’s legendary chandelier. The beloved story and thrilling score – with songs like “Music of the Night,” “All I Ask Of You,” and “Masquerade” – will be performed by a cast and orchestra of 52, making this PHANTOM one of the largest productions now on tour. CHARLIE AND THE CHOCOLATE FACTORY makes its Bass Hall debut Oct. 29-Nov. 3. Roald Dahl’s amazing tale is now Fort Worth’s golden ticket! It’s the perfect recipe for a delectable treat: songs from the original film, including “Pure Imagination,” “The Candy Man,” and “I’ve Got a Golden Ticket,” alongside a toe-tapping and ear-tickling new score from the songwriters of Hairspray. Get ready for Oompa-Loompas, incredible inventions, the great glass elevator, and more, more, more at this everlasting showstopper! MISS SAIGON returns to Bass Hall Dec. 3-8. HELLO, DOLLY! comes to Bass Hall Jan. 14-19, 2020. HAMILTON makes its Bass Hall debut June 9-28, 2020. Photo: Joan Marcus. With book, music and lyrics by Lin-Manuel Miranda, direction by Thomas Kail, choreography by Andy Blankenbuehlerand music supervision and orchestrations by Alex Lacamoire, HAMILTONis based on Ron Chernow’s biography of Founding Father Alexander Hamilton. The HAMILTON creative team previously collaborated on the 2008 Tony Award ® Winning Best Musical IN THE HEIGHTS. HAMILTONfeatures scenic design by David Korins, costume design by Paul Tazewell, lighting design by Howell Binkley, sound design by Nevin Steinberg, hair and wig design by Charles G. LaPointe, casting by Telsey + Company, Bethany Knox, CSA,and General Management by Baseline Theatrical. The musical is produced by Jeffrey Seller, Sander Jacobs, Jill Furmanand The Public Theater. JIMMY BUFFETT’S ESCAPE TO MARGARITAVILLE comes to Bass Hall August 11-16, 2020. Welcome to Margaritaville, where people come to get away from it all and stay to find something they never expected. Get ready for a hilarious and heartwarming musical with the most unforgettable songs from one of music’s greatest story-tellers. USA Todaycalls it “A little slice of paradise!” andEntertainmentWeeklyraves, “It will knock your flip-flops off!” So don’t let the party start without you. A brand-new production of JESUS CHRIST SUPERSTAR is coming to Bass Hall Aug. 25-30, 2020. Jesus Christ Superstar is an iconic musical phenomenon with a worldwide fan base. In celebration of its 50thAnniversary, a new mesmerizing production comes to North America. Originally staged by London’s Regent’s Park Open Air Theatre and helmed by the acclaimed director Timothy Sheader (Crazy for You, Into the Woods) and award-winning choreographer Drew McOnie (King Kong, Strictly Ballroom), this production won the 2017 Olivier Award for Best Musical Revival, garnering unprecedented reviews and accolades. Appealing to both theater audiences and concert music fans, this production pays tribute to the historic 1971 BillboardAlbum of the Year while creating a modern, theatrical world that is uniquely fresh and inspiring. After almost 20 years, THE LION KING returns to Bass Hall in the 2020-2021 season. More than 95 million people around the world have experienced the phenomenon of Disney’s THE LION KING, and now you can, too, when Fort Worth’s best-loved musical returns to Bass Hall after nearly 20 years. Winner of six Tony Awards®, including Best Musical, this landmark musical event brings together one of the most imaginative creative teams on Broadway. Tony Award®-winning director Julie Taymor brings to life a story filled with hope and adventure set against an amazing backdrop of stunning visuals. THE LION KING also features some of Broadway’s most recognizable music, crafted by Tony Award®-winning artists Elton John and Tim Rice. There is simply nothing else like THE LION KING. 2019-2020 season ticket holders will have first access to tickets for THE LION KING when they renew their seats for the 2020-2021 season. The BLUE MAN GROUP returns to Bass Hall Nov. 26-27. An all-new production of THE COLOR PURPLE comes to Bass Hall January 5, 2020. BEAUTIFUL will be at Bass Hall for a limited engagement March 20-22, 2020. Featuring a stunning array of beloved songs written by Gerry Goffin/Carole King and Barry Mann/Cynthia Weil, including “I Feel The Earth Move,” “One Fine Day,” “(You Make Me Feel Like) A Natural Woman,” “You’ve Got A Friend” and the title song, BEAUTIFULhas a book by and Tony® Award-nominee and Academy® Award-nominated writer Douglas McGrath, direction by Marc Bruni, choreography by Josh Prince, and took home two 2014 Tony® Awards and a 2015 Grammy® Award. Previous Previous post: Fort Worth Public Library hosts “Hungry Caterpillar”-inspired events! Next Next post: Acclaimed musical JERSEY BOYS returns to Bass Hall February 12-17! Click above to see what's up at McDavid.